At the end of a recent post, I included pictures of a couple of scrapbook pages I'd done during one of my Vacation Recovery Days. Surprisingly (to me), a couple of people commented and e-mailed me about them, saying that if I ever wanted to show you some more of them, they'd love to see them. And since I am a people-pleaser, I thought I'd do that today. This one will be of more interest to people who already scrapbook, but I'm working on one for another day that will be for those of you who don't scrapbook -- so hopefully there will be something for everyone. I don't. But I DO have a large section of the playroom (formerly our dining room) that serves the same (albeit less pretty) purpose. It works for me, and it's certainly better than working at the kitchen table occasionally and having to put everything up after I've finished working on a few pages. I'd never pull it out to work on it if that were the case! I use almost exclusively Creative Memories scrapbooking materials, mainly because I used to be a consultant for them and they put the fear of God in me about using other companies' stuff. I DO use some stickers that CM lacks (HELLO, CM, you are severely lacking in the Fun at the Lake sticker category), but I'm particular about not letting the stickers touch my pictures so that they won't leach harmful chemicals into them. ANYHOO, Creative Memories has a philosophy that "Done is Beautiful." You don't have to do really elaborate things, as long as you get it in the book and therefore have a record of it. I never did anything all that elaborate to begin with, but when I ran across some plastic blocking templates about five years ago, it literally REVOLUTIONIZED my scrapbooking. The beauty of the templates (the ones I own aren't available anymore, but I've seen similar ones at Hobby Lobby and Michael's) is that they allow you to get so many pictures on a page with just a little cropping. I got so used to using them that I don't even use the templates themselves anymore ... I just have my favorite two or three stored in my head, and I use them over and over again. 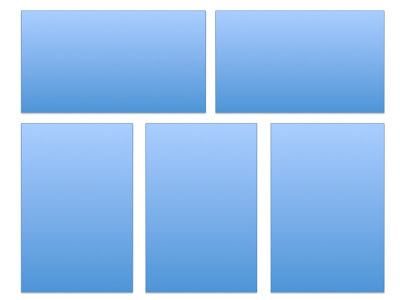 Important Note: Any template design can be used in at least four different ways, by flipping it 90 degrees in each direction. 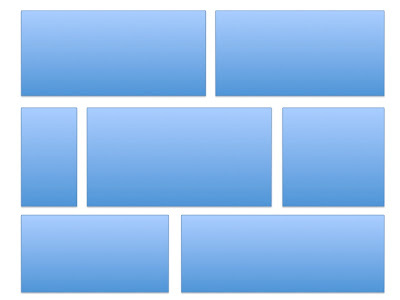 By doing that, you can turn a template with mostly horizontal spaces into one with mostly vertical spaces, or vice versa. The two pages below began in my head as the same template ... seven horizontal spaces on each page (most like the first sample template above). But then I had nine horizontal pictures and one vertical, so I set about trying to figure out how to fit the vertical one in. You can see how the two pages are almost mirror images of each other, except that I fit the vertical one in on the left by carving it out a little and then giving up half of one of the horizontal spaces for the top of the vertical photo. It ended up working out just fine, and because I didn't have too many pictures to try to fit on the pages, I had plenty of space to embellish with stickers and to title and journal. I like to use coordinating papers (that work with the photos) in the little blank spots. You can journal there, or as I mentioned, you can use little embellishments in those spaces ... or, just leave them blank as pops of color. Once I have it all laid out like I want it, I adhere it and then start deciding where to do a title and journaling. On this layout I chose to do a journaling box, but I have a separate post to do about journaling later in the month, and I'll talk about other options then. In the end, I think it's a fresh-looking page layout without a lot of clutter, which I like. I'm going to try to do a little series on scrapbooking, since there was some interest, and if you have any questions you want me to answer or a specific topic you want to know more about, please leave them in the Comments and I'll do my best! Rachel, I didn't know you're a scrapbooker, too. Nice to know! Deborah, thanks for stopping by! I'm so glad you did. I so agree- those plastic template things are awesome! I still use mine ALL THE TIME (well, all the time I scrapbook, which is hardly ever these days!). They are a necessity if you do layouts with a real number of pics on them. I'm sorry, anyone can do a layout with 1-2 pics. 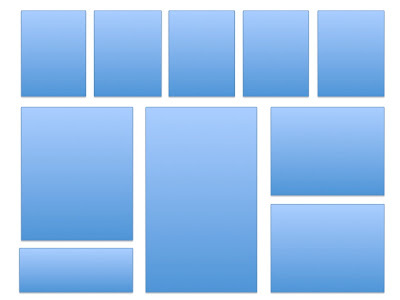 I HATE those for regular scrapping (for a few layouts, fine). Wow - I really went on and on. Anywho..would love any instructions you wanted to give me! Thanks for sharing more layouts! 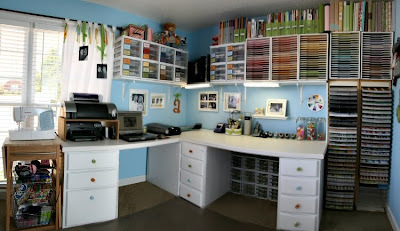 I used to be a CM consultant, too, so I'm also pretty picky about my scrapbook supplies - less so for cards and other crafty projects (yes, I keep my CM and non-CM products stored separately - geek...). I recently set up a craft area in my bedroom so I can get caught up on my kids' scrapbooks - unfortunately birthday and Christmas prep took over almost immediately! Once they are cleaned up, though, I hope to get back to scrapbooking on a regular basis. Thanks for explaining the templates, especially how you modify them. I am not very creative (in the sense of coming up with an original idea), but I love having an idea that can be adjusted to fit my purpose. Looking forward to more in the series! RL, I didn't know you used to be a consultant! I was a consultant for several years, until after Nicholas was born. I was working full-time and just couldn't continue consulting with two kids. I'm glad I got out of it ... I didn't like the administrative side of it and also gave away waaaay too much free stuff. Anonymous, I don't really know the "real" difference between CM and other reputable brands anymore. CM is completely acid-free and lignin-free, and at the time I was a consultant there were other brands that CLAIMED to be free of that stuff but really weren't. I will say that I have over 30 CM albums completed and there's been absolutely no breakdown of my memorabilia or discoloration of my photos, and that wasn't the case when I used cheaper stuff when I was in high school and college. Also, I believe the Micron pens that they sell are the same ones used by the Library of Congress (or used to be), so they have a pretty good seal of approval. What great pages! I LOVE to scrapbook! I am way behind since we moved, though! I would love to have a dedicated area for it, also! I am working on a closet for scrapbooking and sewing. Hopefully it will be done soon!